As California gradually completed its county-by-county vote count over the last several weeks, Hillary Clinton’s national popular vote advantage over Donald Trump grew (with great fanfare in some partisan circles) to its current level of more than 2.8 million votes (+2.08 percentage points). It could be argued that the delay in completing California’s vote count served to emphasize the highly populated state’s enormous footprint on the popular vote, as most citizens went to bed on election night with Trump and Clinton nearly tied in the popular vote. Clinton’s lead has grown ever since with Trump and some of his supporters subsequently making claims of election fraud – perhaps in part to undermine efforts by Democrats who would use their nominee’s popular vote advantage as a way to undermine Trump’s legitimacy or serve as a counterpoint to claims that Trump won a mandate this cycle. But the candidate who truly padded her vote tally as California returns came in over the last month was Green Party nominee Jill Stein. While California accounted for 10.4 percent of the total popular vote in 2016 (14.2 million of 136.7 million votes), Stein won 19.2 percent of her votes in the Golden State, accounting for nearly one in five of her supporters. 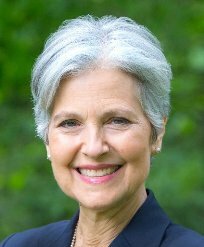 Dr. Stein won 1.4 million votes across the country of which more than 278 thousand came from California. By contrast, Clinton won only 13.3 percent of her votes in California (8.7 of 65.7 million). Due in part to her strong performance in California, Stein by far fared strongest in the Western region of the country, winning 1.71 percent of the 30+ million votes cast across the 13 states in the West. Six of Stein’s Top 10 best states were located in the West with Hawaii at #1 (2.97 percent), Oregon at #2 (2.50 percent), California at #5 (1.96 percent), Alaska at #7 (1.80 percent), Washington at #8 (1.77 percent), and Montana at #9 (1.61 percent). Stein was on the ballot in every Western state except for Nevada. The Green Party nominee’s next best region was the Northeast, where she won 1.21 percent across 11 states and the District of Columbia. Stein fared best in Vermont (2.14 percent, good for #3 in the nation) with Maine (#6, 1.90 percent) and Massachusetts (#10, 1.43 percent) also cracking her Top 10. Stein won just 1.02 percent of the vote in the Midwest – due in part to appearing on the ballot in only 10 of 12 states there, failing to do so in Indiana (where she did qualify to receive write-in votes) and South Dakota. The best showing for Stein in the region was the deep red state of Kansas, where she received 1.98 percent – her fourth highest percentage across the country. Stein won only 714 write-in votes in the Sunflower State during her 2012 presidential bid. Dr. Stein fared quite poorly in the South, winning only 0.58 percent of the region’s 46.5 million votes. 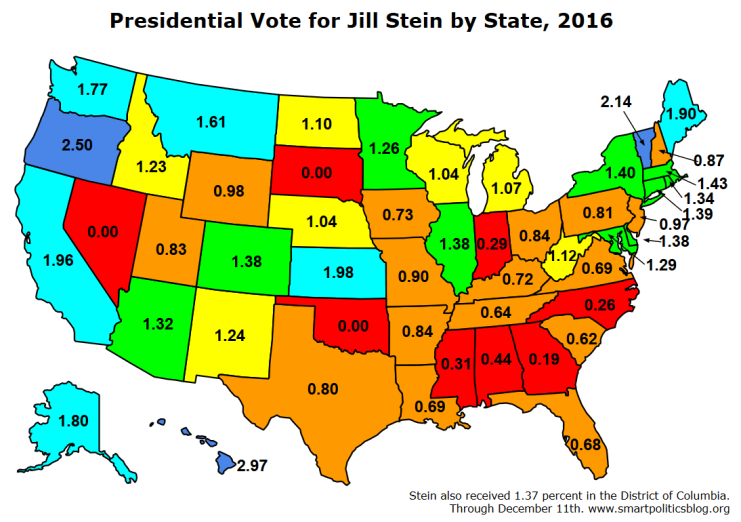 Stein’s top Southern state was West Virginia where she received 1.12 percent – the only state in the region where she eclipsed the one percent mark. Be the first to comment on "1 in 5 Jill Stein Votes Cast in California"